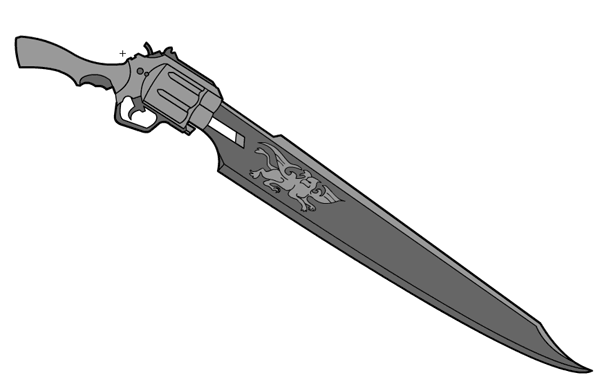 I've finally uploaded Tool's prize for winning Caption Contest 96 -- the following gun blade, available now in ItemRight-Pistols. Hope you like it, Tool, and that everyone gets some use out of it! Cool! Thanks Jeff, hope I didn’t bug you too much about it, I will get to making something as soon as I can with it. Maybe I will add it to the open critique for this week. I should have mentioned, it’s broken into pieces as well. So you have the entire item, just the gun part, and just the blade part. Glad you like it! 😀 I’m a huge Final Fantasy fan, and managed to pick up a wooden replica of one of these pretty recently. Thanks Jeff and Tool! Hey Jeff, you closed the critique before I could post but I thought I would show you what I came up with here. Thanks for your effort to make me the weapon so I put it to use. Sweet, time to make some SeeDs! Here is my use of the gun blade, using 2 other pieces. I wanted an actual “gun” pice to the blade that wasn’t just the bullet housing. So, yeah . . . here’s my main character, McKnight with the gun blade. Mach (7): You need to clear the cache and then reset the page. It’s in Item Right:Pistols. It’s cool looking, but how’s it supposed to fire? Please, place the shoes Converse All Star in the HM3.